The following post explores the process of making Scotch malt whisky. It should be noted that the process varies depending on which distillery you’re looking at as they all have individual specifications, which make their whiskies unique. However, this is a general description of the process involved when making malt whisky. There are six main phases involved when distilling whisky, which we will delve into below. The highest quality barley is selected, spread out on malting floors and soaked in water to initiate germination. It is regularly turned and mixed to prevent too much heat building up and scolding the barley. Traditionally the barley was in a barn next to a kiln, which was then tossed into the air using wooden shovels. Very few distilleries still utilise this technique due to technological advances and the sheer scale of production required. After roughly 7 days of germination the barley is now classed as green malt. To stop the germination the green malt is placed into kilns to dry. The kiln temperatures never go above 70 degrees as to ensure the enzymes produced during germination are not destroyed. It is at this phase peat may be added to the kiln fire to store flavour from the smoke. During the malting step, enzymes are activated which convert starch into sugar when mashing takes place. The now dried green malt is ground into a flour like texture, commonly known as grist. The grist is then added to a mash tun with hot water being added in 3 gradual stages. The hot water starting at around 67 degrees rises to nearly boiling point by the third phase. The mash is then stirred which helps turn all the starch into sugar. Once mashing has been completed you are left with a sweet sugary liquid called wort. The left over grains can be processed into animal feed. The wort is then pumped into washbacks once it is at 20 degrees. The yeast that is added feeds on the sugars, which produces alcohol as well as other compounds that are known as congeners. These are usually in small quantities and add to the flavour of the whisky. The wash will froth violently for many hours as carbon dioxide is produced. After approximately 48 hours the fermentations calms with the wash left sitting at around 6-8% ABV. 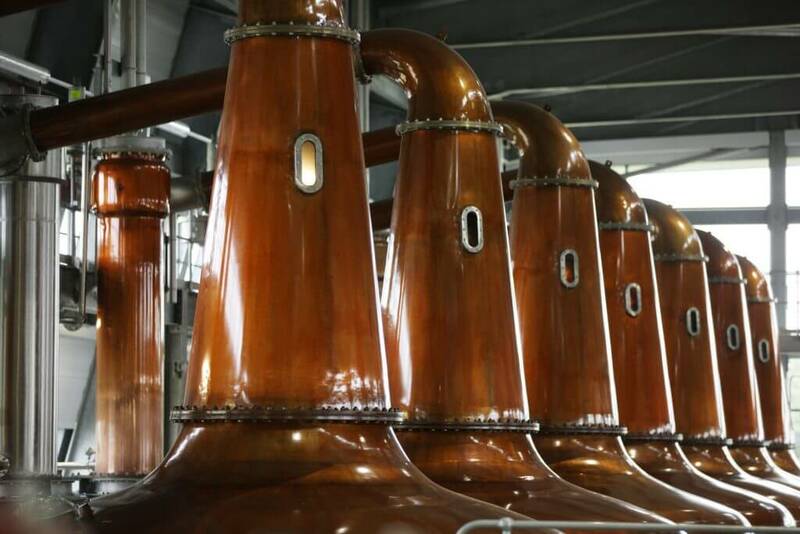 The stills have a large part to play in the taste and complexity of the whisky. Without going into great detail about the science behind it, the various sizes and shapes influence the taste and appearance of the whisky in different ways as well as the amount of time in the still. No two stills are exactly the same with each distillery having their own bespoke still giving their whisky definitive characteristics. Once it’s time in the still is complete, the still is heated to just below boiling point so that the alcohol and various other compounds vaporise. The vapour passes through the neck of the still into either a worm or a condenser. The wash is distilled twice (with Irish Whiskey the wash is distilled three times). Firstly it is distilled in the wash still to separate the water, yeast and residue from the alcohol. The low wines, which is the term for the distillate from the wash still, now has an ABV of about 20%. The spirit still is its’ next destination. The foreshots and the feints that are produced due to the distilling, are both channelled off to be redistilled later when mixed in with the low wines in the next batch. The distillate that remains is known as the heart of the run or the pure centre cut, is about 68% ABV and is collected in the spirit receiver. All distillates end up in the spirit safe. A highly experienced stillman judges and tests the distillates without being able to come in contact with it first hand. The distillate is reduced to maturing strength of about 63% is added to oak casks where the maturation of the whisky begins. Many have previously contained Scotch whisky, sherry or bourbon which add another complexity to the whisky.